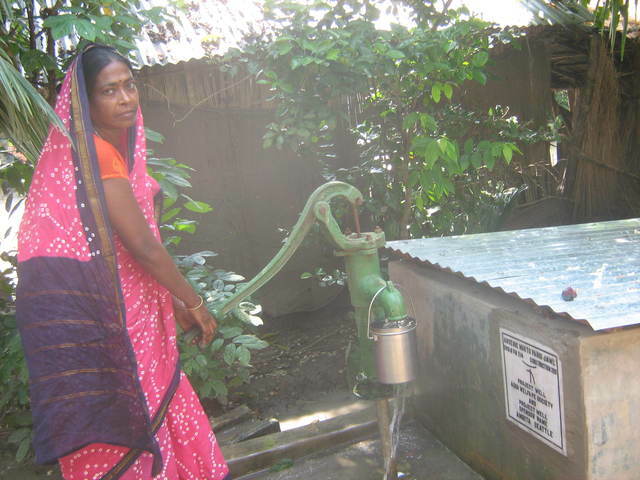 This bore-dugwell #PW214, is in Tangra village of Chakdah block of Nadia district. Mrs. Geeta Karmakar donated the site for the community. this well is used by 12 families 52 people drinking and cooking. repairing of checkvalve .given the theoline100ml. health meeting is ok. people 16 me8 fe5 chi 2 . A short interview of Mrs. Gita Karmakar, the donor of the land to construct the bore-dugwell. according to April 2012 there are 35 beneficiaries of 7 families.